Those felons with experience and interest in driving might think of becoming a commercial driver. This blog post will address the issue of whether or not a felon can get a Commercial Driver’s License (CDL). What is Required to Get a CDL? A Commercial Driver’s License (CDL) is a license required by the federal government to drive specific types of vehicles for commercial or business purposes. There are three classes of a CDL: Class A, B, and C, all of which have the same basic requirements. The differences are in the type of vehicle that can be driven, the Gross Vehicle Weight Rating (GVWR), and the towing allowances among other features. It’s a federal law that someone must be at least 21 years old to drive commercially across state lines. Commercial driving within a person’s state of residence can be done at 18 years of age. When applying for a commercial driver’s license, the DMV will check a person’s driving record for any disqualifications for a CDL. State laws may differ somewhat regarding felony conviction disqualifications. Checking with the state’s DMV will allow someone to know the specific regulations. Commercial drivers must meet strict standards regarding a DUI. If a blood alcohol level is .04 or higher while operating a commercial vehicle, this may be a disqualification from getting a CDL. A single traffic ticket will not disqualify a person from obtaining a CDL. Two or more violations in a certain time may temporarily prevent someone from getting a commercial license. 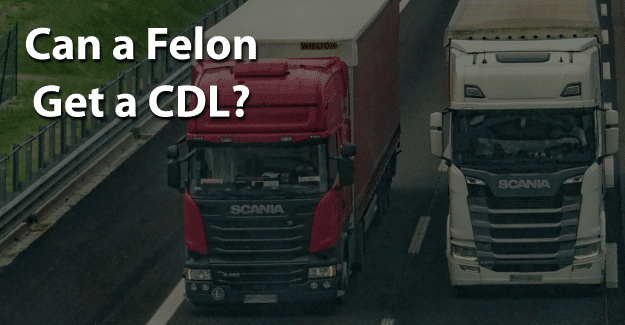 Another challenge for felons after getting a CDL is when they seek a job as a commercial driver. To be successful in this pursuit, it is essential for felons to be honest about their background. Lying on an application is fraud and could result in more jail time. There are many success stories, as the Guide to Being Employed reveals, showing how having a goal, commitment, dedication, and perseverance can assist felons in achieving their dreams. There are re-entry programs, such as drug treatment, and educational opportunities for felons who need them. For many felons, having their felony expunged can give them the chance they need to begin with a clean record and succeed in getting a CDL. It’s a significant challenge, but it might be worth it for a felon that wants to drive trucks or other commercial vehicles and get a CDL. Having his or her record expunged and also documenting any training programs or additional education could make the essential difference in a felon succeeding in getting a CDL. What do you think about this blog post? Have you or someone you know been in the situation of trying to get a CDL with a felony? What was that like for him or her, and how did he or she achieve success? Please tell us in the comments below.